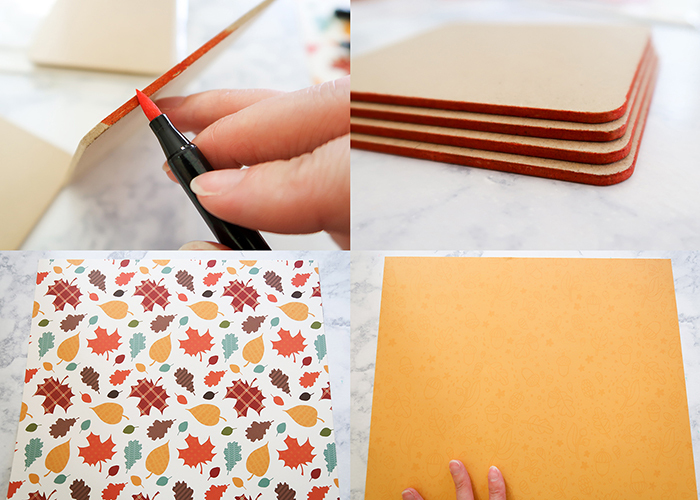 I just love decorating for fall, and it’s super easy to make your own cute decorations. 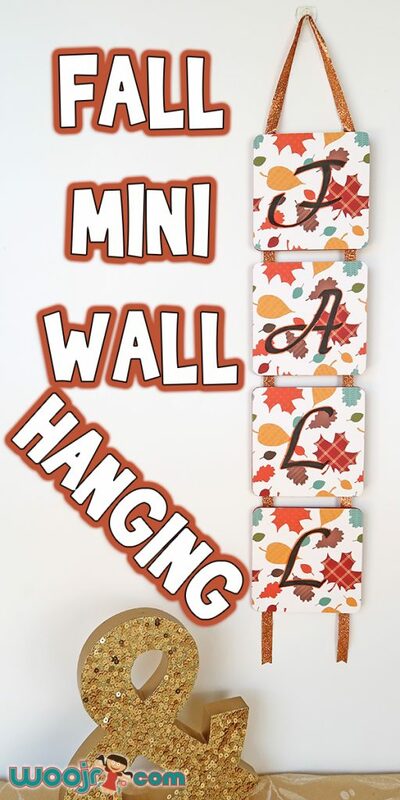 I’m going to teach you how to make this Fall Mini Wall Hanging from just a few simple supplies. 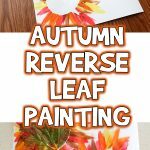 This is great for those small spaces where you need a touch of fall, and even looks cute on a door or the side of a bookcase. Here’s what you’ll need! 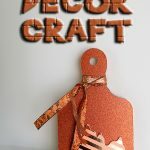 You might also like our fall scarecrow kids craft! 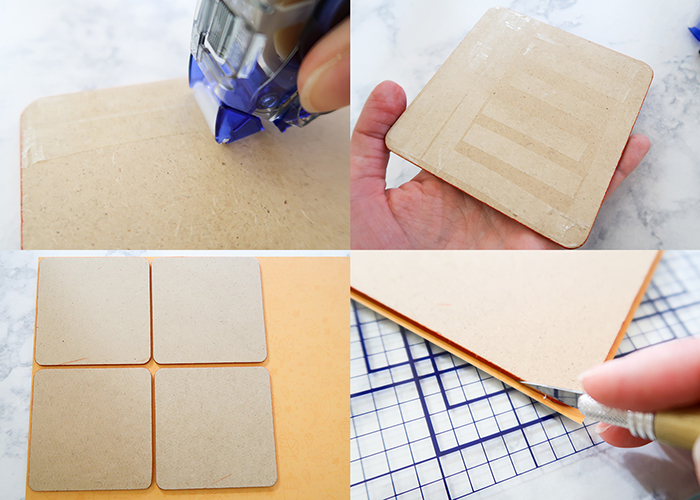 Paperboard coasters. You can find these in any craft store. 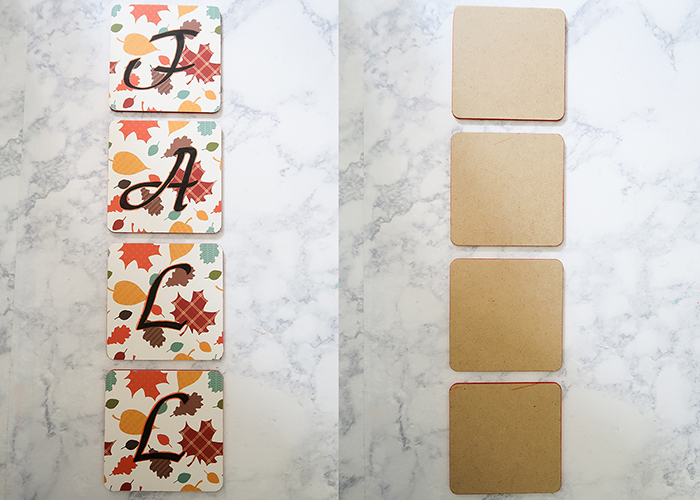 Start by taking your orange marker and coloring the edges of your coasters. You can use paint if you prefer, but I love how quick and easy the marker is. 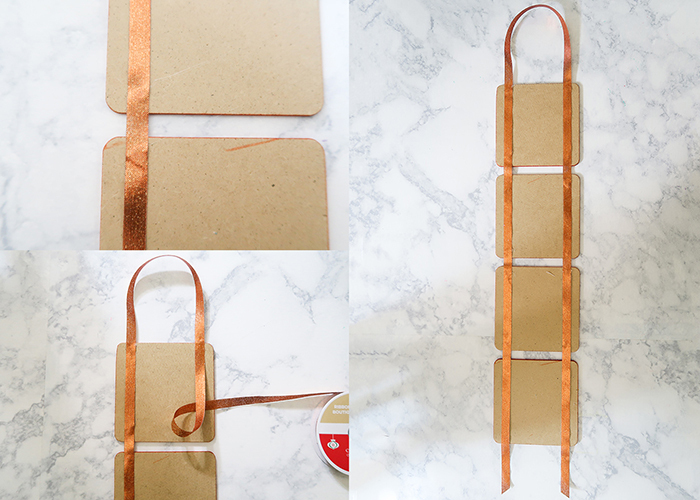 I’m all about making pretty crafts that are as easy to make as possible. When all the edges are colored, let it set for about 30 minutes. Take your paper of choice, and flip it over so the wrong side is up. My paper is double sided, so the light orange pattern is the wrong side. Put your adhesive on one side of your coaster, covering all the edges and putting enough in the middle to have a good grip. Press your coaster down on your paper, smoothing it down firmly. 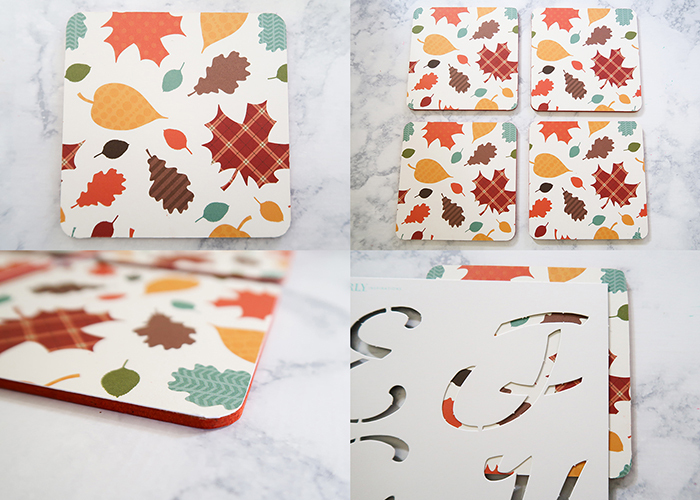 Repeat with all 4 of your coasters, leaving a little space in between to make cutting easier. 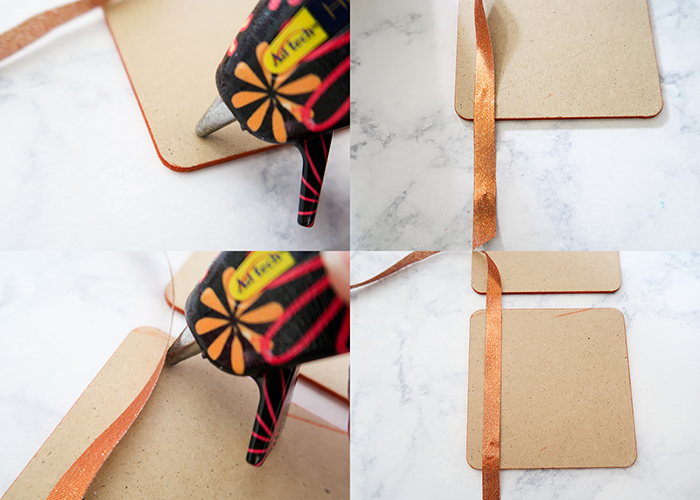 Now take your craft knife and carefully cut the paper around the edges of the coasters. Be careful not to cut into the coaster. If you do make a knick in it, use your orange marker to fill it in. When they’re all cut out, flip them over. How cute!! 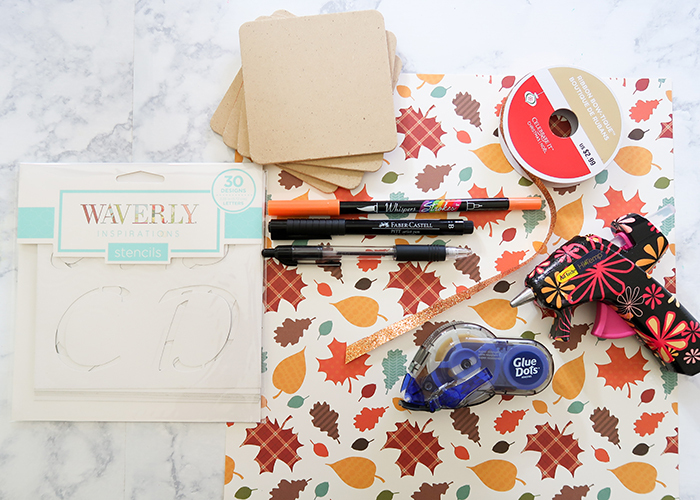 I love how the colorful edges help the paper pattern pop. 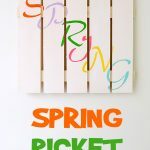 Now you’re going to take your stencil, and line it up so it’s centered on your first coaster. Us your pencil to lightly trace your letter. Lift up your stencil and make sure you’re happy with where the letter is. If you’re like me and don’t like the look of stencil separations, use your pencil to fill in those gaps. Now take your black marker, and start filling in the letter. I like using an India ink pen for super dark coverage, but even a permanent marker will work well. 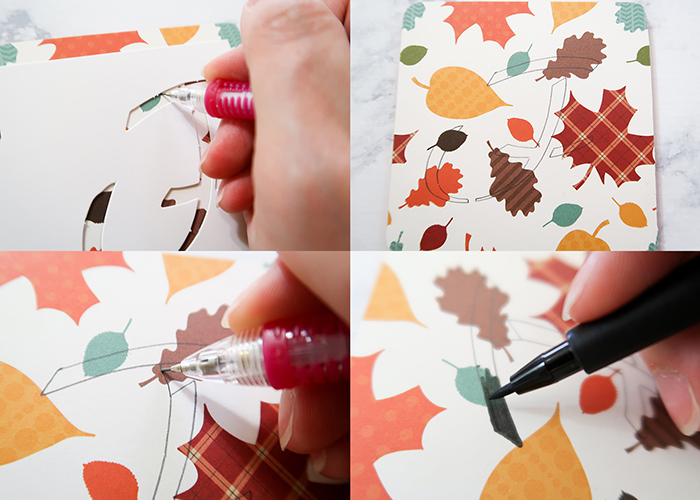 No matter what you use, your first layer is likely to be thin and streaky, so keep adding layers of marker until you’re happy with the opacity of your letter. Let the paper dry for a couple minutes between each layer. 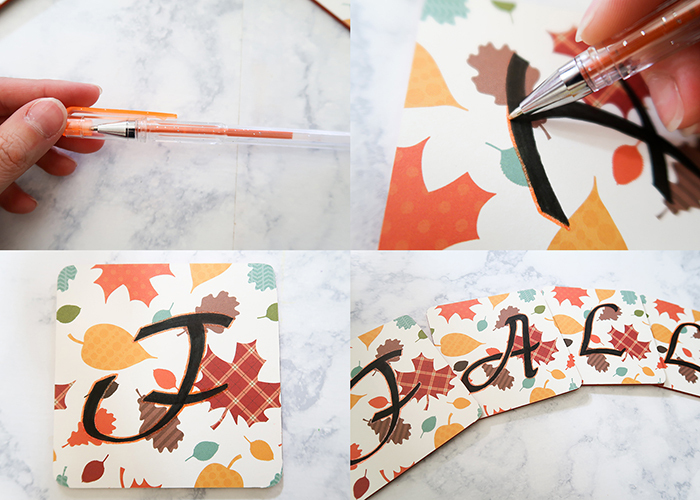 Now go ahead and repeat this for all of your letters. This part is completely optional, but you might want to do it if you feel like your letters don’t pop enough. 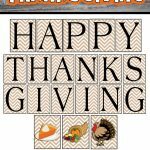 I took an orange glitter gel pen and added an outline to each letter. 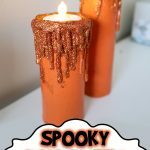 The glitter catches the light and the bright orange helps the letters stand out even more. 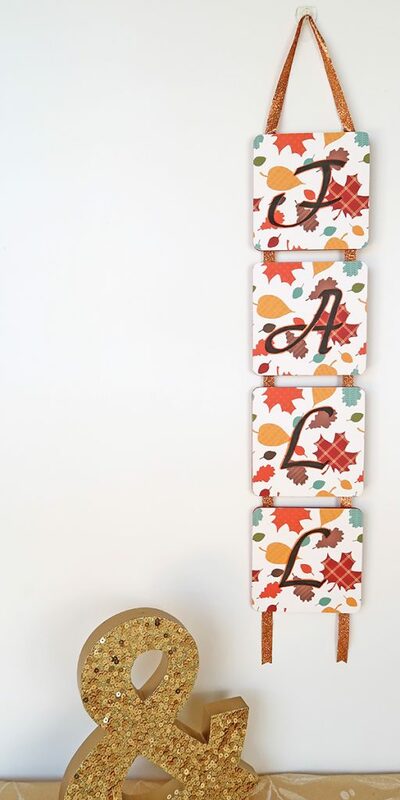 Now go ahead and line up the letters vertically, making sure they’re straight and there is an even distance between each coaster. Flip them over, keeping them lined up. Take your hot glue gun, and start gluing ribbon up one side, leaving about 2 inches of ribbon loose at the bottom of the lowest coaster. Keep going all the way up one side of the coasters, and then leave a large loop at the top and start gluing it back down the other side. Trim the ends of the ribbon however you’d like. You can leave them straight, at an angle, or with a V-cut. Just hang it up, and you’re all done! 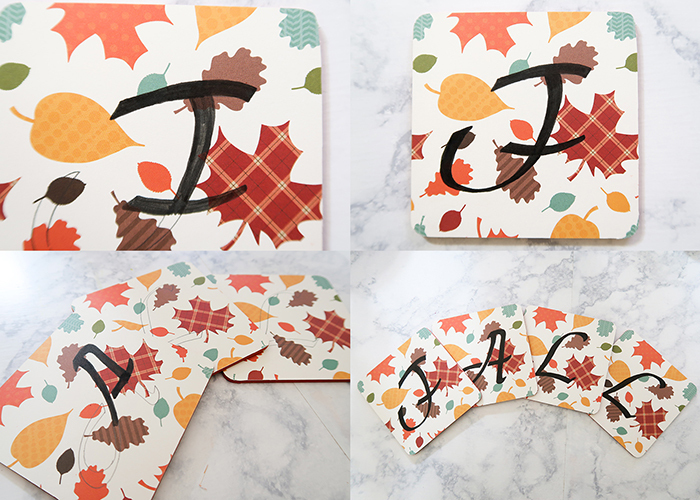 It’s so easy to make pretty decorations that look like the trendy store bought ones. 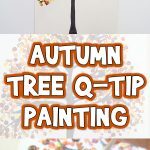 I hope you have fun making this Fall Mini Wall Hanging, and use your creativity with fun colors and patterns!